History of the Air Base 126 "Capitaine Préziosi" of Solenzara. Air Base insignia and emblem. As its counterpart in Sardinia, Solenzara Air Base is one of the four bases, the construction of which has been decided by NATO in 1952 to perform the training of the fighter squadrons belonging to the U.S. Air Force, Belgian Air Force, Netherlands Air Force and French Air Force. Its final location is selected in 1955. The base is located on a former United Stated Army Air Force which hosted the 321st Bombardment Group from April 1944 to April 1945. The group’s operational squadrons were the 445th, 446th, 447th, and 448th Bombardment Squadrons. The 321st Bomber Group was assigned to the 12th Air Force and was equipped with B-25 “Mitchell” bomber aircraft. Below a B-25 belonging to the 446th BS on “Solenzara Airfield” in 1944-45. 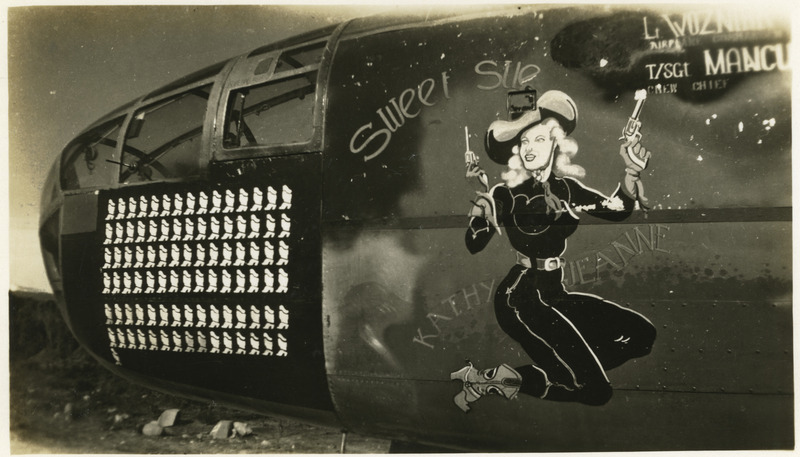 This aircraft bears the serial number 43-27501 and a “Nose Art” showing a cow-girl with pistols and text: Sweet Sue Kathy Jeanne. At the end of 1956, a group of public enterprises starts carrying out earthwork together with the Corps of Bridges and Roads which had conducted several preliminary studies in the past two years. But the winter 1956-57 is very tough and the weather conditions are terrible. The enterprises having already encountered multiple difficulties on the purely physical side are forced to suspend work. May 1957, the warm Mediterranean climate is back, but some new problems soon arise. Work had resumed since a month when the U.S. government announces its decision not to use anymore the Solenzara platform as a training center for the U.S. Air Force and U.S. Navy. This statement following the renunciation of the Netherlands in early 1957, leads to the loan’s suspension and also to the prohibition to use the credits already granted. The works are again suspended, and Belgium and France are subject to a forced privation. However, both of them claim directly SHAPE, Supreme Headquarter Allied Power Europe, which that allows the opening of the Air Base but with some budget cuts. Work plans are revised several times slowing down the construction process tremendously. In May 1960, the unexpected participation of the Federal Republic of Germany (FRG) clears-up the SHAPE reservations, the Payments Committee therefore grants the full financing of the project as initially scheduled. The base will then be designed to host three different squadrons. But this period of indecisiveness is used by some local communities, which in the meanwhile, have become aware of the danger represented by the air-to-ground shooting to react against the project. All this brings up additional problems to the manufacturers who already have to deal with multiple difficulties such as: soil heterogeneity, bad weather, inadequate local supply, lack of industries on the territory, and very rare manpower. A political pressure is also raising against the presence of the Luftwaffe on the island. The Germans will finally decide to settle down in Sardinia on the NATO Air Base of Decimomannu. Initial plans are subject to numerous modifications. In June 1958, the 2960-meter runway is completed but much remains to be done, as the construction of the buildings has just begun. However, the enterprises work very hard and in one year the base is taking the form of a big city with multiple buildings scattered in the maquis. On the 20th of October 1959, the site is discovered by the first military detachment under the command of Colonel Pissotte, whose mission is to prepare the opening of the Base Aérienne 126. On the 1st of July 1960, the decree n°1548/EMAA/1/OR dated 30.May.1960 is officially forming the Base Aérienne 126 of Solenzara. Thirteen days later, the kerosene jet fuel is available and on the 30th of August the first Dassault MD-450 “Ouragan” configurated in tow-ship are landing on the air base. The first shooting campaign is scheduled the next September with the 5e Escadre de Chasse of Orange while French and Belgian establish a reciprocal agreement concerning the use of the shooting center. The document is signed on the 6th of December 1960. The BA126 is now operational, but a lot of problems remain. The support material is insufficient, the available resources do not allow to fly under optimal safety conditions. The staff is overwhelmed with work, accommodation problems are added to the functional troubles, all this undermining the morale of troops. These working conditions don’t serve the interests of the French Air Force and even less send a very bad image of the BA126 which quickly get the reputation of the base where we camp! However, ongoing efforts are paying off, and the receiving of a new building, the connection of a new power line, or some material improvement are welcomed with great satisfaction. The opening of the various Messes, the installation and commissioning of their kitchens, the receiving of the first family accommodation encourage staff to sustain its effort. In October 1961, Lt.Col. Pince takes command of an Air Base which is completely built and organized, even if it still requires several improvements. The 14 June 1962, the Air Base insignia is officially approved. It has the shape of an old shield surrounded by a silver border. In the middle of the shield, a map of Corsica surrounded by the blue Mediterranean Sea. The NATO “compass rose” symbolize a target which points directly to the location of Solenzara Air Base and highlight its membership to NATO. The 12 March 1963, General de Loustal commander of the 4th Région Aérienne present the flag of the 22nd Escadre de Chasse to Lt.Col. Pince. commander of the BA126. Since the formation of the base, the staff capacity has been considerably increased. As a matter of fact, the initial team composed of 4 officers, 7 non-commissioned officers and 11 soldiers was significantly expanded. To the permanent staff should be added the squadron’s personnel being in shooting campaign, the police officers and some French Army staff who’s also permanently live on the base. In the early sixties, the BA126 manages some 1450 persons. Sikorsky H19 than H34 for the helicopters. Concerning the planes : MD312 “Flamant” – SNAC NC701 “Martinet” – F-84F “Thunderstreak” – F-100D/F “Super Sabre” – Mystère IV, Super Mystère B2, SNCASO SO-4050 “Vautour” – Mirage III – Mirage IV – Mirage F1 – Mirage 2000 and several others, as the platform will welcome most of the aircraft belonging to the “Armée de l’Air”. Picture A-20.1: An F-84F from EC 1/9 “Limousin” at Solenzara in 1963. It is equipped with the F-84F since July 1956, and will be disbanded on the 30th of June 1965. Picture A-20.2: Chief-Sergeant Andreani dressed as a “Corsican Bandit”, strike the pose in front of an F-84F from EC 2/9 “Auvergne” in 1962. The 2/9 “Auvergne” will be disbanded on the 1st of July 1965. Picture A-20.3: A North American F-100D Super Sabre from EC 1/11 “Rousillon” at Solenzara in 1966. This aircraft bears the US serial 42157 (54-2157) on the tail. Her squadron code is 11-EI. The EC 1/11 “Rousillon” is equipped with the F-100D/F since May 1958 and is stationed on the BA136 of Bremgarten in West Germany. Picture A-20-4: The F-100D flight line of EC 1/11 “Rousillon” at Solenzara in 1966. Picture A-20.5: The Super Mystère B2 flight line from the 10th Escadre (Creil) at Solenzara in 1967. The front SMB2's in "tow-ship" configuration are belonging to the EC 2/10 "Seine" while the "fighters" at the back are belonging to the EC 1/10 "Valois". Picture A-20.6: A Lockheed T-33A used as liaison aircraft by EC 2/4 “Lafayette” at Solenzara in April 1977. The EC 2/4 “Lafayette” is stationed on the BA116 of Luxeuil. Picture A-20.7: A Mirage III BE, double-seat version of the Mirage III E (E for Electronic) belonging to the EC 2/2 “Côte d’Or” in November 1977. At that time, the EC 2/2 “Côte d’Or” is stationed on the BA102 from Dijon-Longvic. The EC 2/2 is equipped with the Mirage III since 1965 and will be disbanded on the 10 Sept 2007. Picture A-20.8: Two Mirage III E from the EC ¼ “Dauphiné” ready for take-off in 1977. In 1977, the EC ¼ is stationed on the BA116 of Luxeuil-Saint-Sauveur. It will be disbanded on the 29 Jun 2010. Picture A-20.9: A Mirage F1C from EC 3/30 “Lorraine” in tow-ship configuration at landing in 1977. In 1977, EC 3/30 “Lorraine” is stationed on the BA112 of Reims. Its conversion on the Mirage F1C started in June 1974. Picture A-20.10: A Mirage 2000C belonging to the EC ½ “Cigognes” in April 1985. In 1985, the EC ½ is stationed on the BA102 of Dijon-Longvic and is equipped with the Mirage 2000C since 1984. Picture A-20.11: A Mirage F1C from the EC 3/12 “Cornouaille” on the 20 March 1992. The EC 3/12 “Cornouaille” is stationed at that time on the BA103 of Cambrai-Epinoy, and is equipped with the Mirage F1C since 1976. EC 3/12 will be disbanded in July 1995. Picture A-021.6: The 31st Squadron belonging to the 10Wing of Kleine-Brogel with its Commanding Officer (CO), Cpn Robert Derijcke in shooting campaign at Solenzara from 19 March to 13 April 1962. As flying club’s infrastructure is not yet developed on the island, a gliding section is naturally formed on the 13 April 1962. The first flight is performed by Adjudant Monnet with a Castel C-310 glider. The following 13th of August, the parachuting section jumps on Borgo with the “1st Bataillon Parachutiste de Choc”. On the 26th of July 1973, the BA126 is officially named Capitaine Preziosi, war hero from the “Normandie-Niemen” squadron. Since its formation in the late fifties, the BA126 provides with consistency and efficiency the needed support to the various squadrons in shooting campaign. As initially designed, the proximity of the shooting ranges as well as the good meteorological conditions promote the quality of that mission. However, the context evolves with the time, the local people and also the tourists hardly accept the noise nuisances generated by the aircraft. This leads to severe restrictions regarding the use of the “Diane” shooting range, especially during the summer season. The Luftwaffe withdrew from the project in 1959, and starting in the nineties, the Belgian Air Force rate of attendance decreases regularly. From that time on, the BA126 platform becomes more often used by interceptor squadrons rather than by fighter bombers. On the 29th of April 1992, the BA126 is renamed “Capitaine Préziosi” – “Ventiseri-Solenzara”.